Be the first to share your favorite memory, photo or story of Dominic. This memorial page is dedicated for family, friends and future generations to celebrate the life of their loved one. 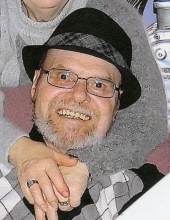 73, of Riley Township, died Wednesday, April 3, 2019, at home with his family at his side. He was born Tuesday, March 26, 1946, in Ferndale the son of the late Paul and Marie (Beniot) Guarnieri. His marriage to Mary Lou Sarrach was Tuesday, June 29, 1965, in Detroit. Dominic was employed at Ford Motor Company Sterling Axle Plant for 31 years until his retirement in 1997. He loved his work and was a very proud man. He loved spending time with his family, the outdoors, going up north, fishing, snowmobiling, hunting, construction projects, cutting grass, playing cards, casino’s, fireworks, traveling, and working on cars. Dominic loved his dogs and all animals, especially feeding ducks and birds. He expressed himself through music and would often bring home 45’s to share with his wife and family. He loved Christmas! He listened to talk radio Paul Harvey, Judge Wapner, etc. He was a very artistic, skilled at leatherwork, and painting. Dominic always fought for the underdog and adored his grandchildren and great-grandchildren. Surviving in addition to his wife Mary of 53 years are three children and their spouses, Geri and Tom Gasiorowski of Harrison Twp., Dominic Jr. and Dorene Guarnieri of Wales Twp. and Scott and Susan Guarnieri of Harrison Twp. ; granddaughters, Jacquelyn and Victoria (Nicholas Christopher), two great-grandchildren, Dominic and Autumn; brother, Albert Guarnieri and several nieces and nephews. He is preceded in death by brothers Paul, Chuck and Leo and sisters, Marie and Rosemary. The family honors the memory of Dominic and invite you to visit and share memories Sunday, April 7, from 2:00 to 8:00 p.m. at Kaatz Funeral Directors, Richmond. Funeral services will be 1:00 p.m. Monday with 12:00 p.m. visiting. Rev. Max Amstutz, Chaplain of McLaren Port Huron Hospital, will officiate. Burial will be in Resurrection Cemetery, Clinton Twp. To send flowers or a remembrance gift to the family of Dominic Guarnieri, please visit our Tribute Store. "Email Address" would like to share the life celebration of Dominic Guarnieri. Click on the "link" to go to share a favorite memory or leave a condolence message for the family.